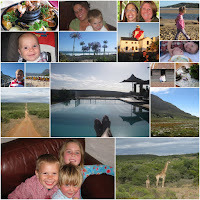 It's official, I've uploaded most of our vacation photos and the video from our trip to South Africa earlier this month. I've also created a collage with some of my favorites. Enjoy, and thanks for following our many adventures! Liz, Thank you for sharing with us. What a perfect holiday . I checked also you tube videos. Boys are soooo cute!!. I am sure Lucas loved all animals. Hope your next visit is Down Under. Last week we had terrible storm in The Gap. I have a few photos on my blog.